Gage started delayed intensification last Thursday. It was a long time in coming, six months in fact. Some days, I never thought we’d get to this point, and now that we are here I am scared of all the complications that can happen. I take his temperature like every hour just to make sure he doesn’t have some random fever. I call is doctors because his cough is back, and oh my gosh is that a rumble in his chest, did the cough move to his lungs? I have an overnight bag packed just in case we have to go to the hospital at the last moment. This is what Gage is going to be subjected to in the up coming weeks, he should also be receiving Pegasparaginase (PEG), which is two shots in his legs during week one. But he had the allergic reaction to the last shots of PEG he received, which in turn caused him to get pancreatitis and the ulcers on his pancreas that landed us in the hospital for three weeks before Christmas. So thank you Baby Jeebus, no more PEG shots! Since starting delayed intensification, Gage has been so cranky. He is on seven days of dexamethasone, and seven days off for a couple of weeks and not only is he getting adorably chubby, since he is eating like a little piggy but he is getting not so adorably bitchy, as well. His nick name from the hospital is back, we call him Ragin’ Gage. He screams and fusses all day long and as soon as Daddy comes home, he is all sunshine and lolly-pops. I have actually called the Hubs at work, in tears begging him to come home, because there is nothing I can do to fix Gages tantrums. I know it’s the medicines fault that he is acting this way, but after seven hours of screaming fits, all rationalization is out the window. Though the highlight to being at delayed intensification is once we are done with this round of chemotherapy we head into maintenance, which is kind of like the light at the end of the tunnel. This entry was posted in Uncategorized and tagged broviac, cancer kids, candida, chemo, chmotherapy, Christmas, death, delayed intensification, failure, Gage, healing, hickman line, hope, hospital, leukemia, life, live, love, maintenance, pancreatitis, panic attacks, picc line, sick. Bookmark the permalink. that has to be the cutest chubby picture of gage in my life!!! put one up of the new chubby gage! give him kisses for me! I cant wait for him to get all chubby! Hang in there buddy, the light is near!! Hang in there Lisa, tantrums and everything is part of the road to the end. You need a happy place to go to when he’s screaming at you and for you and against you. You’re so close. What does it say about me that my kids throws fits all the time and he doesn’t have medicine or hospitals or any other good reason? I wonder if all the moms have the same problem. Horror for mommy, but an angel for daddy or daycare or grandma…. the list goes on but I deal with the cranky baby. I just tell myself its because he loves me most and knows he can be cranky with me and I am not going anywhere. Hang in there, thinking of you! I can see the light Lisa, it’s so super close and you three have fought so hard and you will win. 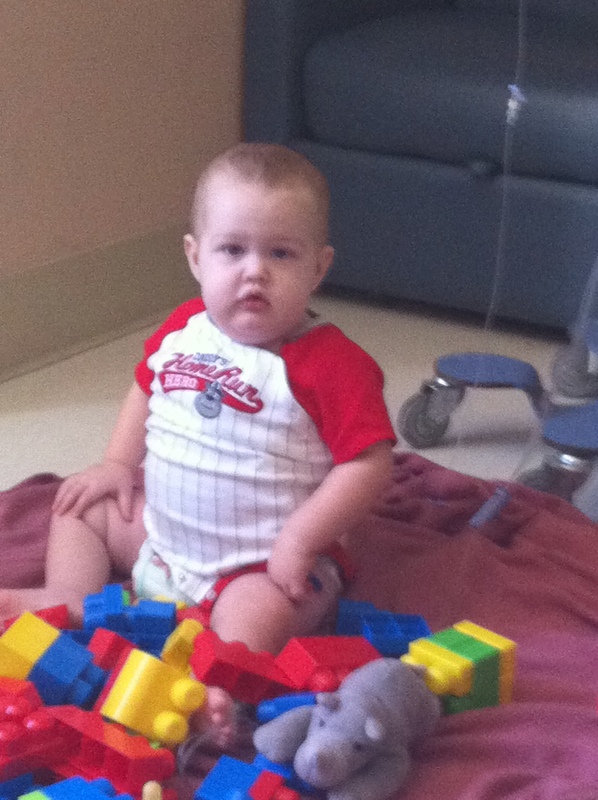 Wow, Gage is just a little fighter and a champion!… He has you, a wonderful, loving mom (& dad, too). I am truly praying harder than ever for this little nugget of love!